CINCINNATI - He’s 71 years old now and trying to re-energize. So, it’s only natural that Frisch’s Big Boy would join the empty nesters and millennials leasing new space Downtown. Frisch’s Restaurants announced Thursday that it will open a 90-to-100 seat restaurant in the Carew Tower early next year. The restaurant will face Fifth Street next to Boi Na Braza Brazilian Steak House. Frisch's will hire up to 80 employees to operate the new store. Carew Tower did not respond to WCPO questions about the deal. The new store will end a 14-year hiatus for the company, which closed its Sixth Street location in 2004. But a lot has changed for Big Boy in those 14 years. The founding Maier family, which controlled Frisch’s for generations, sold the publicly traded company in 2015 to NRD Capital in Atlanta. Frisch’s now employs about 6,800 people at 121 stores, roughly the same as two years ago. Headquarters and commissary employment is down about 18 percent to 155. In his 14 months as CEO, Vaughn has experimented with new menu items and tested new technology and store formats, all the while honoring company traditions like Frisch’s sponsorship of the Cincinnati Ballet’s annual Nutcracker performance. Frisch’s announced a four-year renewal last December. 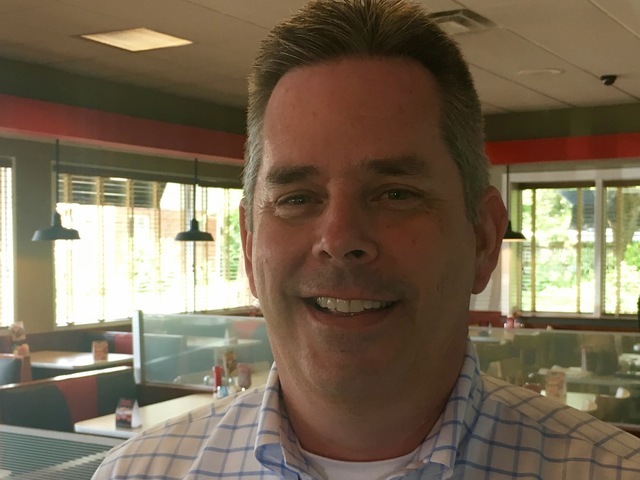 Vaughn said Frisch’s best chance for growth is to hold onto its heritage while evolving to keep pace with industry trends. Its Primetime Burger lineup is an example, tapping into the gourmet burger trend without hampering sales of its traditional sandwiches like the Big Boy, Brawny Lad and Swiss Miss. Vaughn said the Primetime lineup and a $5 combo promotion caused younger customers to try the Big Boy sandwich for the first time last year. “Once they try it they’re hooked on it,” he said. Frisch's had similar success with other promotions. Wednesday sales increased 5.3 percent after Frisch's introduced "Brupper," a Wednesday night breakfast bar. And sales of carbonated drinks increased 3.3 percent after it launched a summer promotion around lemonade-flavored drinks. The next step for Frisch’s will be an increase in capital investments. Vaughn said up to 12 stores will be remodeled this year, increasing to 18 next year. New-store construction will grow from 2-4 next year to as many as eight in 2019. Cincinnati, Indianapolis, Memphis and Nashville are among the cities targeted for future growth. The Downtown store will open about the same time as a Northern Kentucky location for which Vaughn declined to reveal an address. He also declined to provide revenue and profit figures for the company. But he did say NRD Capital is happy with the company’s performance, as are Frisch’s customers. The 4,000-square-foot Downtown store is a prototype that could lead to other Downtown locations, Vaughn said. It will test catering options and new technologies, like the Ziosk tablet that lets customers pay at the table and ordering apps for takeout and catering options. An online survey will influence the store’s design, operating hours and in-store amenities. The urban restaurant landscape has changed quite a bit since Frisch’s last competed Downtown, but Vaughn is convinced his double-decker burger stacks up well against foodie phenoms like Holtman’s doughnuts or Taste of Belgium's chicken waffles.